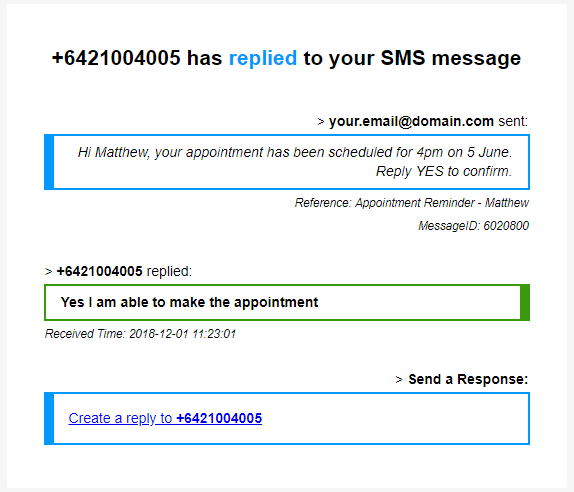 SMS - reminders are delivered stragitht to the mobile phone. They are received on-the-go and are typically answered within a five minute timeframe. Mobile phones are able to reply to the SMS to send a response. Facebook - for businesses with high volumes of reminders, we offer a Facebook integration option to deliver reminders via Facebook Messenger. Email - send reminders via email as a low touch, low cost way of sending reminders automatically. We handle the email delivery and technicalities. Voice - for the most responsive option, use voice! Reminders are delivered as a live voice call, whereby the recipient answers, listens to the message, and can optionally press a keypad button to confirm their appointment. Step 3: Type the message into the body of the email, then click Send! Reply Messages: If the mobile phone replies to the message, it will be delivered to you as an email. You can reply to the email to send a message back to the mobile phone. Send a broadcast by attaching a CSV file of contacts. The REST API is fully featured and supports multiple message types and tracking delivery results and responses. Learn more about the REST API. Alternative input methods such as FTP are supported. Contact us for information on other submission options.